The “Floral of the above” purple floral print backless skater dress from Lulu’s. The classics- red, black, blue, sparkle, and all out glam- are the homecoming dress trends that have most commonly graced the dance floors in recent years. 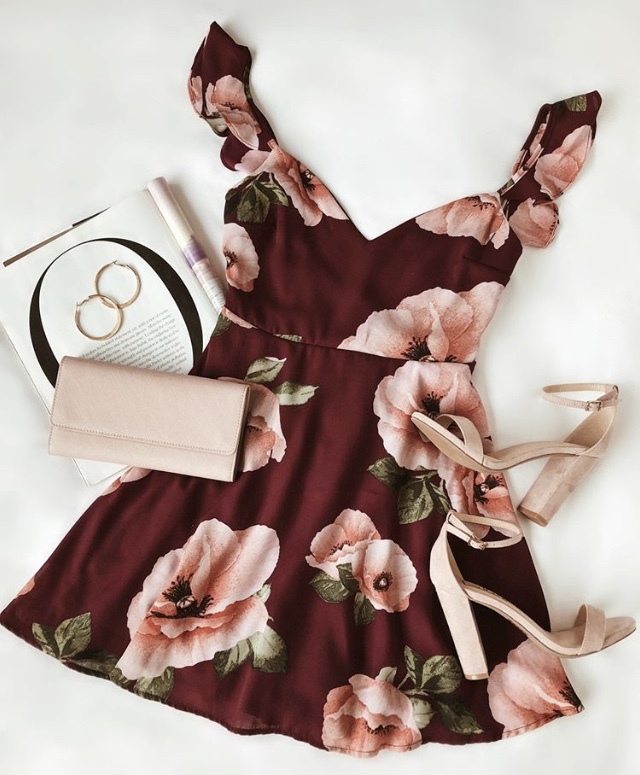 Dresses with muted “fall or wintery” colors decked out with rhinestones, sequins, and beads have- until recently-topped the popular trends for the fall homecoming dances, but the tables are turning for 2018. This year homecoming trends in dresses, accessories, and shoes will contrast greatly from the past movements. Although the dances theme is “blast from the past”, we will be seeing varying styles that differ from anything seen before. As a testament to the trends of the past-bright colors, sparkle and a high neck all in one cutout- junior Josephina Capannari reflects on what she sported to the dance her freshman year. “Freshman year I wore a bright green high-neck dress that had a sparkly belt, and looking back at it now I would never wear it again,” junior Josephina Capannari said. The most obvious change predicted for this homecoming season will be in the dresses the girl’s choose to wear to the dance. Even though the dance will be taking place in the fall on September 29th, the most prominent dress styles will be screaming summer. Embodying this summer vibe we will see the colors yellow, lavender, and pink. Moving away from the usual bodycon or form-fitting dresses, girl’s this year are seeing the beauty in simplicity from the cut to the absence of auxiliary detailing. Fit and flare, lots of lace, and cold shoulders will showcase an elegant and more modest appearance. Particularly talented sewers are rising to the challenge by designing and creating their own homecoming dresses this year. No worries about showing up in the same dress as someone else! With simplicity shining throughout the dress, girls will be relying on accessories to amplify and pull the look together. However, bold and chunky pieces are out and delicate pieces are ready to be highlighted. If one is looking to make a statement this year an individual can do so through eye-catching earrings or layered dainty necklaces. If this isn’t your cup of tea and you’re still looking to make a statement, travel to the shoe department to find your fix. Girls will be seen grabbing a suede wrapped heel to complete their look. If you want to spice it up go for a colored blocked heel or an adventurous pattern like florals, cheetah, or even snakeskin. 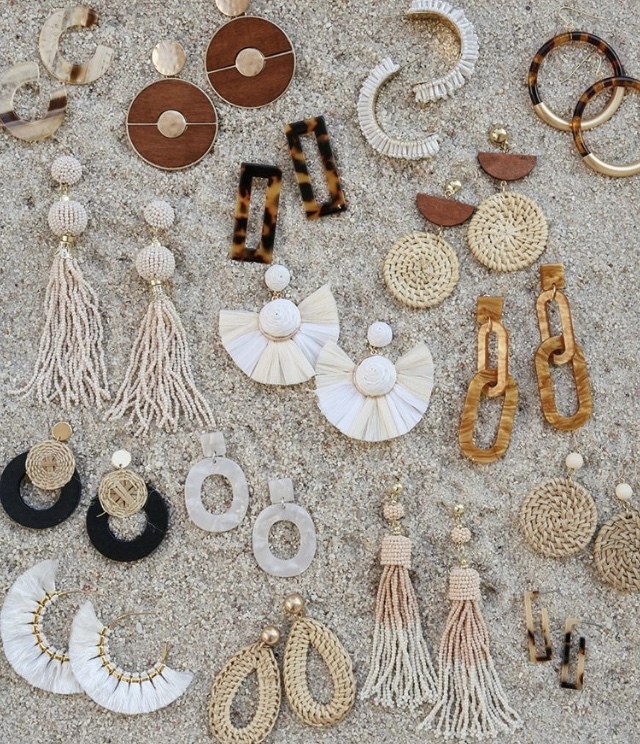 An assortment of statement earrings perfect addition to a simple dress. From Lulu’s. “I am going to accessorize with gold jewelry, and since my dress is off the shoulder I’m planning to add a necklace to make it more interesting,” Johnson said.